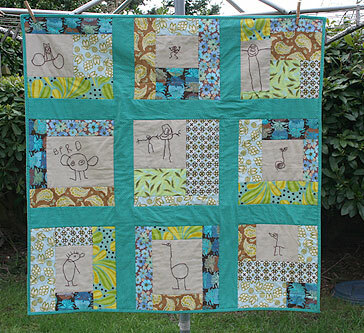 This quilt, made for my then 3-year-old son, was inspired by his sweet drawings. The drawings were transferred and then hand-embroidered onto linen (inspired by Soulemama). The blocks consist of a mixture of scraps which he helped pick out: some chocolate lollipop, a few michael millers, some fresh cuts and one yummy print called ginger blossom that I adore. It measures 42 by 42 inches, machine pieced and quilted, the binding is hand sewn. I especially enjoyed embroidering his drawings, tracing the lines of his inventive little creations. This is just precious. This is something you will treasure for many years and I am sure it will be passed down. I have seem some done with students drawing with permanent markers but they will fade after a few years but the way you did this was perfect. Thanks for sharing your picture. What a great memory quilt this will be for your son that will last a lifetime. what a great way to show your son you love him. I love this! It's just wonderful! I really love that you involved your son with this, with the drawings and that he helped picked out the fabrics. It is so special that way and the quilt is beautiful too. What a sweet idea and it turned out great!